It's been a glorius day here, bright sun and to end it a stunning sunset. 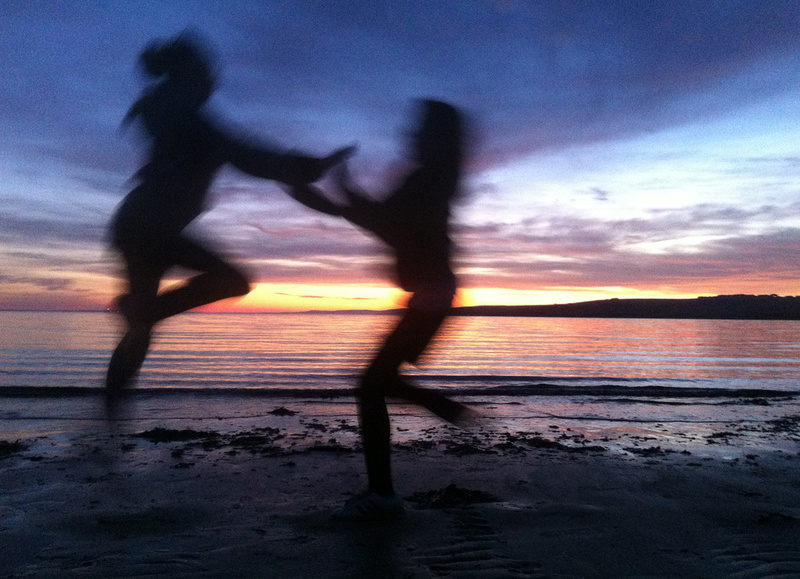 We went to the beach to catch the tail end of it and my daughter and her friend kindly ran and jumped for me! They're quite chuffed and were happy to get their photo on here. Thank you girls! Love the colours and the dreamy quality of this. Nicely done! Nice shot. Can't believe you took that on a phone! That is brilliant Ingrid. Stunning contre jour shot. Fav for me. Very nice photo. I love your normal style but it is lovely to see your daughter in a shot. Great shot! The girls r4ally add to the atmosphere of the shot. Wow! Love this shot, great composition. It is joyful, love the movement of those blurry silhouettes against that beautiful sunset. Great pov too! Brilliant. I lve the colours and the etherealness (if there is such a word) of the girls. Nice picture, Like the colours, the movement! Thanks everybody - the girls were fair chuffed to see I put this up and they were giggling like mad doing this ! Getting them into photography from a young age! They were really interested in Carla's work too @vase and are keen to make pinholes and develop their own prints! What a great shot! Feels dreamlike. Really nice ! Colors are great ! It had to be Beautiful day. Very cool indeed, has to be a fav. Cool capture, lovely feel to the movement and great colours. Fantastic.